Shankar’s 2.0 is an amazing visual spectacle with incredible special effects and jaw-dropping action, but despite all the thousands of Rajinikanths, clouds of flying mobile phones and an unusually charismatic Akshay Kumar as the villain of the piece, it fails to fully impress due to a garbled and, at times, dull story. Not that the lack of a credible story really matters for a large-scale Superstar movie, but the transition between one incredible VFX scene to another really needed some sort of rationale to develop a relationship with the characters and bring in some suspense. And 2.0 just doesn’t have that connection. No matter how good Rajinikanth and Akshay Kumar are in their roles, or how truly magnificent the visual effects are, at the end of the day for me the film needs a little more soul. The film opens with mobile phones suddenly gaining a life of their own and zooming off into the sky all over Tamil Nadu. These opening sequences are excellent as Shankar shows just how pervasive mobile phone use is, including the moment when we see an entire family all staring at their phones just as the father announces that of course he spends quality time with his family. Everyone is here – those obsessed with taking selfies, people using their phone for work, for family connections, even one man using a mobile phone as a plaything for his child, and it for a time it seems that Shankar might be making a statement about overuse of mobile phones. But it’s not that simple. Naturally Chennai is thrown into total chaos by the “great mobile phone disappearance” but the problems are only just beginning. A massive cloud of mobile phones transforms into a bird’s talons and starts ripping cell towers out of the ground, prominent mobile carrier company owners are attacked and a gigantic bird, formed out of mobile phones starts attacking people in the streets. This is seriously inventive stuff, and Shankar has allowed his imagination free rein to create magnificent visuals that really are spectacular, while the fast-paced action just never stops. Dr Vaseegaran (Rajinikanth) is aided this time round by an android called Nila (Amy Jackson) whose body proportions are reminiscent of a Barbie doll, but who does at least get the chance to show off her superhuman skills in the battle against the villain, Pakshi Rajan (Akshay Kumar). Pakshi Rajan is an eminent ornithologist who ends up suiciding after he fails in his attempts to stop the radiation from mobile phones killing off his beloved birds. Thanks to ‘negative energy’ and all those dead birds, he somehow transforms into an entity capable of animating mobile phones, and sets out to destroy the humans who have caused all the problems in the first place. There is a flashback sequence that paints Pakshi Rajan as an environmental hero with Akshay Kumar playing him as an old, broken man who wears baggy cardigans and weeps for a dead sparrow – so naturally he’s a more sympathetic character than the self-absorbed Dr Vaseegaran. And that’s part of the problem I have with the entire film. Dr Vaseegaran seems to simply want to bring Chitti back to life, and show off his new-fangled invention to save the day, while Pakshi Rajan has a legitimate issue and a real crusade that’s easy to support. So, when Chitti arrives on the scene, it actually appears that he’s fighting on the wrong side since Pakshi Rajan doesn’t come across as a bad guy until much later. Thankfully when the 2.0 reboot Chitti takes over, his swagger and snappy dialogue helps lift the second half, ably helped by the excellent visuals and inventive ways that a cell phone can be used to kill. Pakshi Rajan develops a villain-worthy sneer and his casual disregard for the thousands of people who end up having to dodge bullets and large pieces of football stadium during the finale does start to make him seem a least a bit nastier. Team Chitti though has an equal disregard for bystanders and finally pulls a stunt with pigeons that’s even more vicious than all of Pakshi Rajan’s gory killings. That has the effect of making Pakshi Rajan actually seem more moral than Team Chitti despite his murderous tendencies. To try and compensate, the last scene makes some attempt to promote Pakshi Rajan’s cause while still chastising him for killing so many people, but it just doesn’t work, although the final action sequences are brilliantly done. I’m not usually a fan of Akshay Kumar, but he is impressive here and he does an excellent job of humanising Pakshi Rajan and giving him an almost plausible reason to attack mobile phones. I also appreciated his bird-like mannerisms when he transforms into a giant birdman and his dedication to the role by using feathers for eyebrows. For the most part he simply screams at the camera in bird form, but during the flashback sequence he does display the demeanour and despair of a broken man very well. Rajinikanth is on screen for most of the film in one or more of his different characters – Dr Vaseegaran, Chitti or 2.0. He is as charismatic as ever in every appearance, although Dr Vaseegaran is even more annoyingly self-absorbed here than he was in Endhiran. Despite playing a robot, as Chitti and his alter ego 2.0, Rajinikanth gets to display plenty of personality and each time he appears he brings life and energy to the screen. Thankfully the annoying Sana only appears as a whingey voice over the phone this time round, while the rest of the cast only appear briefly, either to be killed by Pakshi Rajan or as part of the government trying to cope with the crisis. Sudhanshu Pandey appears as Dhinendra Bohra, the son of Bohra from Endhiran, but this seems to be a real wasted opportunity and his character isn’t well utilised despite a promising start. I’m not sure exactly what Shankar was trying to say here – if indeed he was trying to say anything at all. Could this be a film against mobile phones and the way they have come to take over our lives? Is there really an environmental message here about radiation and the dangers purportedly associated with cell towers? It’s all rather muddled and the emotional back-story for the villain doesn’t help matters either. However, as an all-out action adventure 2.0 works well enough. A.R. 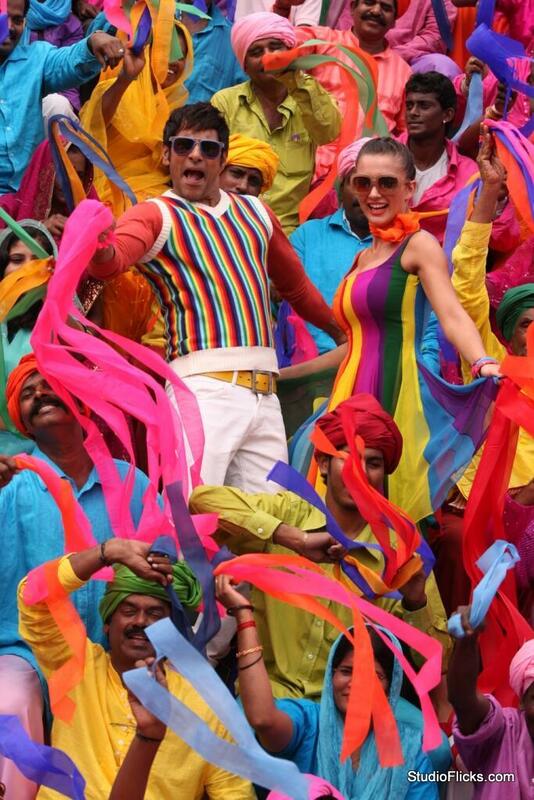 Rahman’s music is used sparingly throughout the film, although there is one montage song and a dance track over the end titles, which is fun. Thanks to Rekhs for the excellent subtitles (in yellow too, so very readable) and kudos to cinematographer Nirav Shah for making the regular shots just as good as the VFX. Yes, most of the money has been spent on the effects in this film, and little on the screenplay, but given the end result I’d say overall it’s money well spent. I didn’t see the 3-D version, but even in 2-D the effects are simply superb and for that alone the film really does need to be seen in the cinema. For the rest, Rajinikanth is excellent, Akshay Kumar totally nails being a murderous birdman, Amy Jackson does well as an animated robot, and best of all with this plot, no-one was using their cell-phone during the show. That’s definitely a win! I was rather apprehensive about watching Velraj’s new film, given that VIP was such a huge hit, and follow-up films from new directors can be rather hit and miss. However with Dhanush on board again surely things couldn’t go too badly wrong? Well, no, at least not completely. Thankfully Velraj doesn’t simply try for a VIP 2, but instead starts with a rather different atmosphere and a more mature and responsible hero, although he does venture back into more familiar territory as the story reaches resolution. He’s also enlisted a generally excellent cast who keep the film entertaining even if the story does falter somewhat in the second half. Still, for a follow up film it’s not a bad attempt and Dhanush is as good as always ensuring Thanga Magan is worth a watch. The opening scene is possibly one of the best in the film, and works well to raise questions and draw the audience into the story. As the rain pelts down, Thamizh (Dhanush) shepherds his pregnant wife Yamuna (Samantha) and his mother (Raadhika Sarathkumar) into a small and rather grimy house, ably assisted by his friend Kumaran (Sathish). By everyone’s depressed and miserable faces, it’s clear that something terrible has happened and that this is a major step downwards for the family, reinforced by Thamizh immediately setting out to look for a job. That’s the cue for an extended flash back sequence that explains why Thamizh is unemployed and his family have had to relocate and downsize into such an undesirable location. The flash back starts with a young Thamizh roaming around Chennai with his two friends Kumaran and Aravindh (Adith Arun). The three students spend all their time together until the day Thamizh sees a girl at the temple and instantly falls in love. Hema D’Souza (Amy Jackson) is an apparently intelligent, modern Tamil woman who has some very definite ideas about what she wants from life. She’s a student too, studying architecture, and isn’t afraid to berate Thamizh when she thinks he is following her. But after such a strong beginning, Hema becomes more of a caricature, drinking beer and allowing a mildly physical intimacy that ensures she isn’t going to be the one leaving with the guy – Hema is much too liberated to get a happy ending in a Tamil film! Dhanush does his usual thing of managing to appear much younger than he really is, and as the relationship between Thamizh and Hema is fairly typical of young and infatuated lovers he doesn’t have to stretch for the role. In comparison Amy Jackson seems rather out of place and despite all the physical intimacy she has little chemistry with Dhanush leading to a relationship that never appears realistic on her side. Amy looks older than Dhanush too, which doesn’t help, but at least when they do finally split it’s reasonably plausible with his immaturity at odds with her ambition finally leading to the separation. After the break-up Thamizh falls in line with his mothers’ wishes, getting a job working in the tax office with his father and agreeing to an arranged marriage with Yamuna. Yamuna is the ideal traditional wife; quiet, shy and happy staying at home all day to help her mother-in-law. She’s a complete contrast from Hema, but in her own way Yamuna is just as much of a caricature, following the description of classic filmi wife to the letter. Samantha is a much better actress than the character of Yamuna requires, but she still manages to shine despite her rather one-dimensional role. At least she has plenty of chemistry with Dhanush and even if the relationship is an old-fashioned and clichéd version of marriage they do seem to have a mutual respect and a partnership that was lacking between Thamizh and Hema. 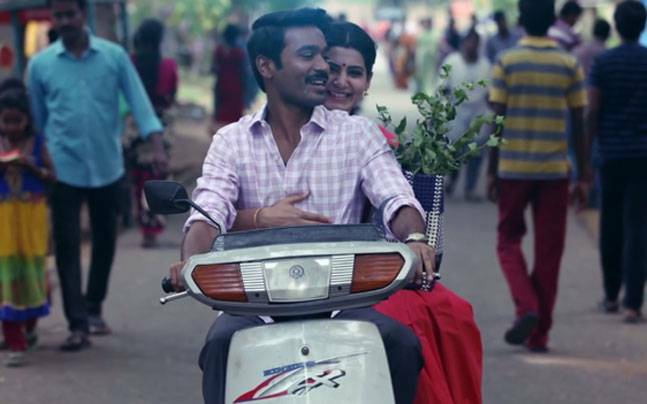 The first half works well and Dhanush is on top form as dutiful son, young lover, then husband and father-to-be. He transitions from one to the other very naturally and it’s good to see him have a happier relationship with his family than he usually portrays in his films. Samantha is also excellent here and both K.S. Ravikumar and Raadhika Sarathkumar provide solid support as Thamizh’s parents. The love stories are both sweet in their different ways and there is some good and funny dialogue too which ensures that all the drama doesn’t get too overpowering. The second half is where things start to go a bit pear-shaped when the story moves on to the problems with Thamizh’s father (K.S. Ravikumar) and his boss Prakash Kumar (Jayaprakash). There is a missing file, possibly some missing money and the flimsy storyline has very little substance but plenty of artifice. It’s a credit to the actors involved that the film still entertains even though large parts of the story don’t make much sense and there are too many large plot holes. The villain of the story is Aravindh who was neglected and left out of everything while Thamizh and Satish were off romancing Hema and her friend – apparently that’s enough of a reason to make you a total jerk and a criminal to boot. However Aravindh is an ineffectual adversary and suffers from his absence in the first half of the film, leaving him without any real depth to his character. Adith does as well as he can with a very sketchy role, but it’s not enough to make Aravindh a plausible opponent. On a plus note though, Amy Jackson reappears and is much better in this part of the film, while Dhanush is excellent at depicting Thamizh’s growth as a dependable husband and supportive son as he investigates what really happened with his father. Even though the story needs a large suspension of disbelief, there is still some good dialogue and the relationship between Thamizh and Yamuna is well developed and beautifully pictured. The main problem I have with Thanga Magan is the end. Unfortunately after spending two hours establishing Thamizh as a kind and thoughtful son and husband, the climax suddenly sees him turn into the swaggering, mass-dialogue spouting fighting machine last seen at the end of VIP. Perhaps Velraj couldn’t think of how else Thamizh could win the day, but the abrupt transition is at odds with the rest of the film and seems unnecessary. Thamizh could have achieved the same result without all the posturing and fighting, particularly since the fight scenes aren’t particularly well choreographed and the dialogue is clunky and more suited to a battlefield than a discussion in an office. Dhanush still manages to carry the mass-hero dialogue and posturing well of course, but the film deserves a more satisfying climax that meshes better with the rest of the film. Although Thanga Magan doesn’t deliver as well as VIP, particularly in regards to the storyline in the second half, the performances are very watchable and Dhanush is simply excellent. He has the ability to show his character’s growth and maturation throughout the film, while still telling the story and ably supporting the rest of the cast. He always appears very natural, whether he’s playing a young student or a more matured married man, and never seems to be obviously ‘acting’. 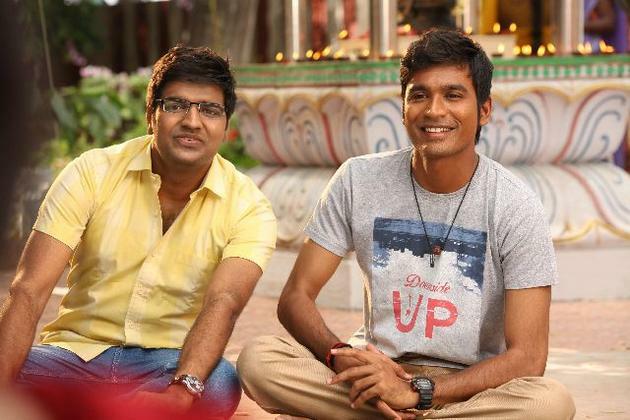 Sathish too does a good job, fitting the role of Thamizh’s ‘side-kick’ while he shares a natural rapport with Dhanush which ensures the comedy between the two works well. Samantha is the other standout performer and even if her role of a submissive wife is rather clichéd, she still plays it with grace and dignity and a good sense of humour. Anirudh supplies the music and it works well for the songs although none are as instantly catchy as I’ve come to expect from his previous soundtracks. I was also a little disappointed by the lack of dancing in the picturisations, as most of the songs are montages to show the two romances. They are all appealingly shot and look good, but I do miss watching Dhanush dance! Worth watching at least once for Dhanush, Samantha and Sathish and an amusing and entertaining first half. Shankar is a director who has proved in the past to have amazing vision and a seemingly unending wealth of imaginative ideas. Many of his previous films have been visually stunning with incredible effects and novel concepts, but he seems to have missed the mark somewhat with his latest movie I. He has the benefit of an excellent cast and a potentially interesting story, but somehow the sum of the whole is not as good as each individual part. 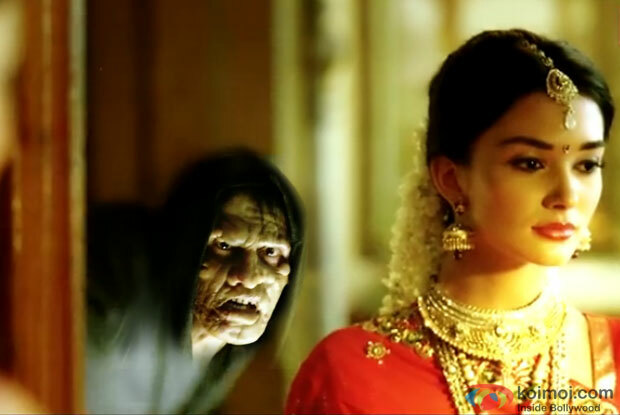 The film has a few too many cringe-worthy moments to make me want to see it again although Vikram is superb, and Amy Jackson is also impressive despite a rather limited role. However their characters aren’t particularly likeable and the story meanders annoyingly along several inconsequential paths before finally reaching the predictable and cloyingly trite end. I’m not even going to complain about the dodgy medicine since there was so much else that bothered me more about the improbable and often distasteful screenplay, but the ‘science’ is just as far-fetched as the rest of the story. Really the only reason I can give to watch I is Vikram and his impressive ability to transform himself into just about anyone, and that’s not quite enough to justify the 3 hours plus of I. The story revolves around Lingesan (Vikram), a body builder from the back streets whose ambition in life is to win the Mr India competition. Be warned, there is a lot of flexing and posing in the first half hour of the film, while Lingesan tries to win the Mr Tamil Nadu crown from a large number of other over-muscled and over-oiled men in very skimpy bathers. It’s quite impressive that Vikram managed to achieve this look, but it’s not attractive and I was much happier once he put his clothes back on and backed off on the oil. Unfortunately he doesn’t really stop the flexing and posing even when fully clothed. There is also a ridiculous fight scene backstage at the Mr Tamil Nadu championships with Lingesan managing to fight off multiple opponents including his arch-rival Ravi (M. Kamaraj). Ravi is a much better contender for the title of Mr Tamil Nadu so it’s a little surprising that he takes Lingesan as an opponent so seriously, but at least there is a relatively valid reason for the ongoing enmity between the two men, even if it does seem unlikely. Lingesan is also obsessed with model Diya (Amy Jackson) to the point where he purchases absolutely anything she has endorsed, and I do mean absolutely everything. It’s quite creepy initially but does move out of stalker territory once Diya and Lingesan meet and Lingesan starts behaving like a 13 year old besotted schoolboy instead. It’s not a lot better but at least it’s funnier. Santhanan provides the rest of the comedy as Lingesan’s brother Babu, and for the most part he’s reasonably amusing, although a comedy track really wasn’t needed given just how ridiculous the plot becomes in the second half of the film. From body builder to model is apparently as simple as getting a haircut and shaving off a moustache and with that Lingesan transforms into successful model Lee on the basis of one ad campaign and a romance with his muse Diya. However to get to this point Lingesan has pissed off quite a few people including the obnoxiously sleazy model John (Upen Patel) who is furious at being foiled in his attempts to get Diya into bed. Diya’s transgender make-up artist Osma (Ojas Rajani) also falls in love with Lingesan and is hurt and vengeful after his rather forceful rejection of her advances. John’s behavior is fairly gross but nothing unexpected for a masala movie, but the ‘romance’ between Osma and Lee is badly developed and feels more homophobic and derogatory than necessary. I can’t decide if Shankar was trying to be clever here and make a point about how the world views people who are transgender given that the film is based in the advertising world and uses image and ideals of beauty to develop the plot, or if this really was just a bad piece of writing, but it’s hard to watch whatever the reasoning. Interspersed with the frothy romance are flashes to the present day where a hunched and grossly deformed Lingesan has kidnapped Diya on her wedding day, and the story gradually shifts to a tale of vengeance and medical improbability. Here at least the idea of image and beauty does get a little more developed although the masala element is still very much to the fore. Lingesan seeks revenge on the people who have caused his illness and as scientific reality goes out the window the story gets ever more ridiculous until the Beauty and Beast song seems quite normal and believable by comparison. It’s also a pleasant relief from all the disfigurement and maiming, although like other songs in the film it’s not well integrated into the narrative. There are a number of more mundane inconsistencies such as the sudden turnaround in Diya’s treatment of hunchback Lingesan and Lingesan’s continued strength and agility given his deformed body. Not that any of the rest of it makes any more sense, but there is too much that is implausible and the story becomes too far-fetched to take seriously. However there are also far too many scenes where the people variously handicapped as a result of Lingesan’s revenge are ridiculed and mocked for their appearance and disability. It’s part of the plot sure – these are people who now look as ugly on the outside as they are on the inside, but I found this really quite shocking and abhorrent, particularly as it’s meant to be part of the comedy and is anything but funny. This is definitely Vikram’s show and he does do an amazing job in portraying the two different faces of Lingesan. Amy Jackson is much better than I expected, and the rest of the cast are all good given that they are all overshadowed by the powerhouse that is Vikram. The special effects by Weta Workshop are also very well done, and it’s such a shame that the story doesn’t come anywhere close to matching the visuals of the film. Of course it’s a story set in a world where image is all and appearance trumps substance at every stage so perhaps that’s not too surprising after all.